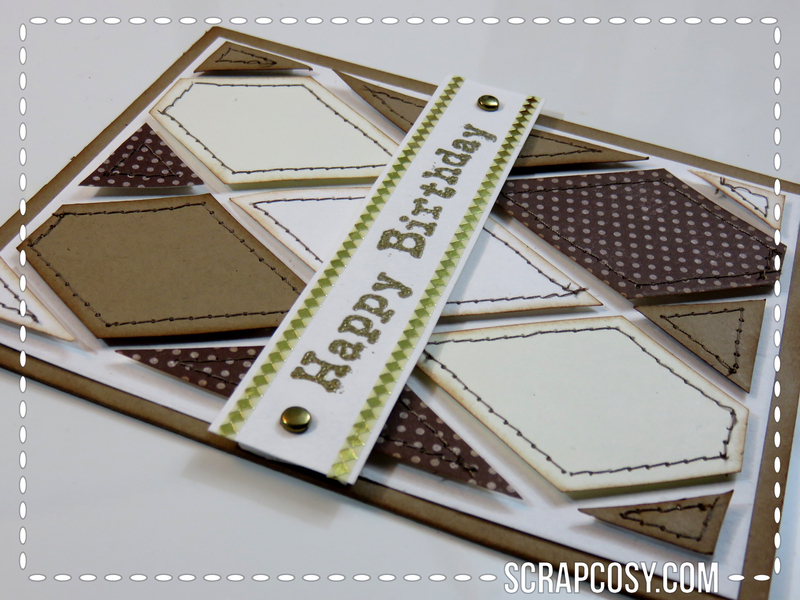 I had wanted to try making a card that involved sewing paper for quite some time now, so since my Dad’s birthday was coming, I decided to try this technique in his birthday card. 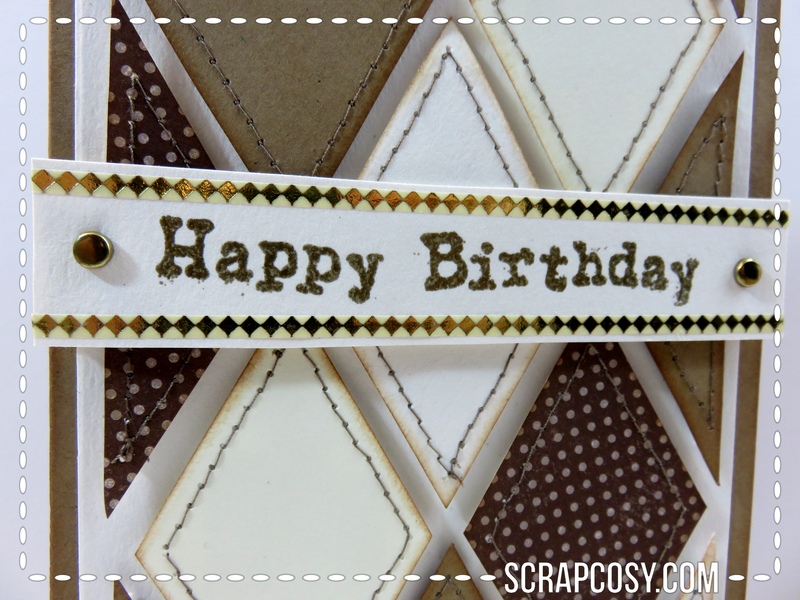 I chosed a diamond pattern with diamonds in different neutral colours: brown, white and cream, and of course, I couldn’t help adding some gold in the Happy Birthday and in the brads and washi tape that frame it. If you see, the diamonds make nice shadows and this is because I’ve sticked them using foam adhesive and this makes the card to have volume (in the video I forgot to mention that the diamonds are also aged with distress ink, before sticking them and in the same way I did for the edges of the card). For the Happy Birthday I did a gold embossing and to frame it I used a golden brad on each side and a very thin washi tape above and below. Since the stripe has also golden diamonds it brings it together with the background. 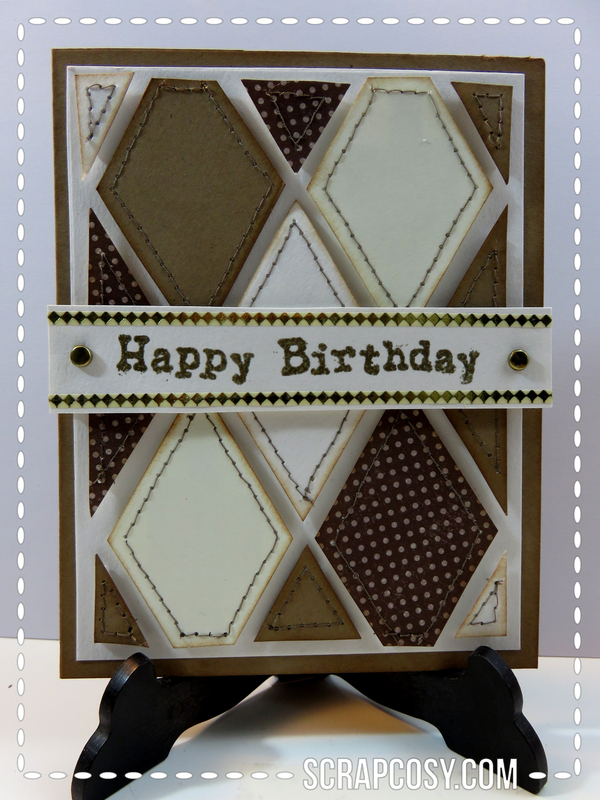 In the same way as I did for the diamonds, this Happy Birthday is sticked to the card using foam adhesive (In the video I forgot to mention that I put double side foam adhesive on each side of the brad, so it is levelled with the background). Hacía mucho tiempo que quería hacer una tarjeta cosiendo papel, así que aproveché que venía el cumpleaños de mi papi para probar esta técnica. Elegí un diseño con rombos de distintos colores neutros: marrones, blancos, crema… y como no podía faltar, incorporé el color dorado en el Happy Birthday, en los brads y en la cinta decorativa que lo rodea. Para el Happy Birthday hice un embossing en dorado y para enmarcarlo, utilicé un brad dorado a cada lado y una cinta decorativa washi que es muy delgadita encima y debajo. Como la cinta también tiene rombos (dorados), hace que quede más integrada con el fondo. Al igual que los rombos, este Happy Birthday está pegado sobre el fondo utilizando espuma adhesiva de doble cara (en el vídeo me olvidé de comentar que he puesto espuma dos veces en los trocitos de al lado de cada brad, para nivelarlo). Gracias por leer! Espero que os haya gustado y si es así, dejadme un comentario 🙂 Hasta el próximo post! Nos vemos en unas dos semanas! MUY INTERESANTE, Y BIEN EXPLICADO, ME QUEDO ASOMBRADO DEL TRABAJO QUE LLLEVA, PERO ES QUE QUEDA UNA TARJETA MEMORABLE. Me encanta la tarjeta, las explicaciones, la musica!! Felicidades por este super blog, tienes mucho talento, tanto manual como pedagogico.